Vecna Robotics is developing a remarkable, innovative mobile robot platform called the BEAR (Battlefield Extraction-Assist Robot). Designed for battlefield causality extraction, the BEAR robot has a simplified humanoid upper body structure and a unique lower body—a bipedal structure with traction on each upper and lower leg. 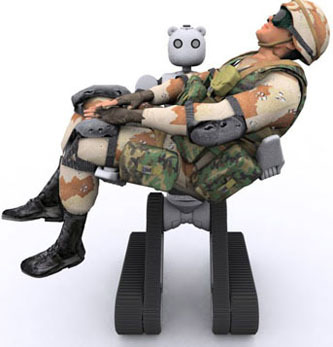 Since the BEAR robot’s joints are powered with hydraulic actuators, it has high power density in actuation and it is suitable for applications in battlefield casualty handling and transportation. In this project with Army TARDEC, Energid Technologies is using its software for both modeling the robot in simulation and controlling the hardware. We focus on the tasks of manipulation and, through the use of Energid’s Selectin toolkit, perception. The goal is to develop algorithms and software which will allow the BEAR to perceive and manipulate objects in the environment, including wounded soldiers.